Whenever and wherever you’re spending time outside, almost nothing is more important than staying hydrated. Depending on the weather and the type of activity you’re doing, it’s possible to sweat out a liter or more of water every hour. In past decades, hikers, runners, and cyclists would reach for their trusty water bottle, unscrew the cap, take a drink, replace the cap, and put the bottle back. That’s five steps just to get a sip of water, and it’s the kind of inconvenience that prevented people from hydrating properly. Then the hydration pack appeared, equipped with a flexible water bladder holding a few liters of water and a drinking tube to allow on-the-go consumption. Thanks to these packs, it’s been much easier to prevent dehydration ever since. That being said, there are a wide variety of packs to choose from, and the right one for you will depend on your specific needs. Let’s start with the basics of a hydration pack: it’s a small backpack that’s going to carry a bladder and probably a few other things. What kind of activities will you use it for? A good pack for cycling after work is different from one designed for hiking all day in the desert. Regardless of how you’re going to use it, these are the important features to consider. We’ll start with the most critical feature: does the pack adequately move water from the bladder to your mouth? A plastic hydration bladder is fairly simple, so not much can go wrong. But there are a few things to look for. Does the system leak? The first major failure point is the fill cap, which unscrews to let you fill the bladder. The O-rings in these caps are replaceable, but some break faster than others. Other failure points are where the bladder meets the drinking tube and where the tube meets the bite guard. Some manufacturers use lower quality plastic, which eventually becomes stiff and brittle, allowing water to leak out either of those points. Lastly, most packs come with a shut-off system and/or a dust cover. Some don’t have them, though, which means they’ll start leaking everywhere if the bite guard gets wedged between your body and a piece of gear. After polishing off a liter or two, you also might notice that water doesn’t come out as easily. That’s because some hydration packs lack a system for securing the bladder and preventing it from slumping over as it starts to empty. Look for a bag that has an internal loop for attaching the bladder, which will prevent this issue. In addition to the bladder, even the most minimalist packs can hold some snacks or sunscreen. But if you’re hitting some remote backcountry trails, you might also want to bring a First-Aid kit, some emergency supplies, or a pair of trekking poles. In that case, it’s a good idea to get a pack with 20+ liters of storage, which should be enough to carry all the things you’ll need. Having all that space isn’t much use if you need to spend time digging for what you’re looking for, though. Find a bag that has enough internal storage, but also look to see what kind of organizational features it offers. Does it have internal pockets and a key clip, or is it just one big cavernous hole? Most hydration pack users are looking for something relatively small and lightweight; otherwise, they’d be using a full-sized backpack with a hydration bladder pocket. That’s why hydration packs are great for runners, cyclists, and minimalist day hikers who aren’t carrying a lot of equipment. The pack’s weight is determined by two factors: how large it is (its capacity) and the fabric its made from. Most backpacks are built using some variation of nylon and polyester, and the toughest ones use 500-1,000-denier grade or higher. These packs will last longer and stand up to more punishment, but stronger fabrics do come with more weight. Good zippers are also critical for strong construction. The Japanese company YKK is the gold standard for quality, but the best way to test zippers is give them a pull yourself. A final consideration is how the backpack is put together. It’s the little things that separate a mediocre pack from a great one. One of the most overlooked design questions is how the pack will keep your back from getting too hot. Many incorporate a mesh back panel that allows air to flow between your back and the surface of the pack, though some designs are definitely more effective than others. Consider what kind of terrain you’ll be hiking in to determine if this feature is critical. If you’re trudging thought the desert or running marathons, good ventilation will be a must. Lastly, does the pack come with a hip belt? This is critical if you’re carrying any weight besides the water, or if you’re engaged in high-impact sports like running where the pack might otherwise flop around. One of the best ways to find an affordable piece of outdoor gear is to look for a product that does one thing very well and doesn’t just have a bunch of features you don’t need. Unigear’s Tactical is a good example of this. It’ll carry your 2.5 liters of water, and the rugged construction will keep it functional for years to come – but it doesn’t have unnecessary bells and whistles. The first thing you’ll notice with this tactical pack is its 900-denier polyester construction – it feels, quite literally, bullet-proof. If you’re someone who likes to throw their gear into the back of a truck and take off on a backcountry adventure, you’ll appreciate the Unigear’s ruggedness. The drinking tube is equally durable, featuring a built-in dust cover to keep the bite valve clean and ready to drink from whenever thirst hits. That’s not to say the Unigear is without issues, though, the most obvious being that it doesn’t hold much besides the bladder. The organizer pouch at the front of the pack can hold a few small items, but the pack’s suspension system isn’t designed for much weight. Another issue is that the bladder isn’t nearly as durable as the pack itself. The bladder’s cap and seams wear out with heavy use and will become quite leaky – not something you want to find out after packing it a few miles into the backcountry. The back panel also doesn’t provide much ventilation, so it’s not a great choice for high-intensity workouts or hiking through a sweltering desert. The Unigear Tactical is a good choice for users who don’t need much space for extra supplies and aren’t too worried about staying cool while wearing it. It’s a tough pack, and as long as you treat the bladder with care, it should serve you well for many years. Very strong 900-denier polyester construction. Dust cover on the drinking tube. Little ventilation from back panel. Osprey has been one of the top backpack manufacturers for many years, and with good reason, as they design incredibly comfortable packs that last for years. The Skarab 24 is one of their larger packs (24 liters), and is capable of meeting most of your needs, even on the longest day hikes. Where the Skarab excels over most other hydration packs is its comfort. The shoulder straps are well-padded, and the suspension system distributes the weight well to prevent hot spots. It’s also a great pack for hikers who want to stay organized. The front access panel drops down to reveal several organizational pockets for small items like a flashlight or First-Aid supplies. Like many packs, it also has a fabric-lined stash pocket for electronics and sunglasses. The biggest downside to the Skarab is that it’s just a little too expensive for what it is. That’s something you’d expect from a name brand like Osprey, but there are a few subpar features that might make you think twice about it. The hip belt is pretty narrow and doesn’t have any pockets, though it will still prevent the pack from flopping during high impact-activities. It also doesn’t come with a rain cover, which you would expect for a pack that costs two or three times what many of its competitors do. The Skarab 24 is an exceptionally comfortable pack that will keep you very organized, and it’s a great choice if you don’t mind paying a little more for a top-quality pack. Wide opening front access panel with organizer inside. Narrow hip belt with no pockets. If the Skarab isn’t quite for you, Osprey has another great hydration option: the Manta AG 36. A little larger, and with the company’s patented Anti-Gravity System, it’s sure to please anyone who will be taking their hydration pack on extended journeys. The Anti-Gravity (AG) System consists of a tightly-stretched mesh back that runs between two curved frame pieces. By creating a larger gap and allowing a constant breeze to run along your back, this system works much better than the foam back panels found on most packs. At 36 liters, the Manta also has the most storage space of any of the packs on this list. Such a capacity is more in the realm of daypacks (or even a small overnighter) than hydration packs. However, if you tend to need a lot of gear on your outings (like if you’re a photographer), you’ll appreciate the extra space. The padded hip belt provides support for that extra weight, making this a comfortable all-day pack. Most of the problems with the Manta are related to its size; it costs four or five times as much as some of the smaller packs on this list, and weighs almost three pounds empty. Some of the organizational pouches within its cavernous interior are also not that easy to use. If you need the space, though, this is still the best pack for the job. The Manta AG 36 is a good choice for anyone who wants some extra storage space and excellent ventilation. Just know that, like most Osprey packs, it has a price tag to match. Hip belt with padded wings. Weighs more than most hydration packs. Some pockets not very user-friendly. No one has done more to popularize hydration bladders than CamelBak. Prior to their efforts, we were all carrying water bottles around and fumbling with our packs whenever we needed a drink. It’s thanks to CamelBak that those days are over, and their tradition of great hydration packs continues with the 15.5-liter Cloud Walker. The first thing you’ll notice about the Cloud Walker is that it looks pretty much like a normal day pack. It’s sleek, fits close to the body, and has a number of attachment points for carabiners and trekking poles. The foam back panel and shoulder straps put some space between your sweaty back and the pack, providing excellent ventilation. The Cloud Walker is everything you’d want in a quality backpack, just a little bit smaller. With such a great design, you have to expect that it’s going to cost a bit more – the Cloud Walker costs as much as any good day pack would. With its capacity of 15.5 liters, it will hold some extra clothes and snacks, but it doesn’t have a ton of space. However, one of the biggest disappointments with this pack is that it doesn’t have a dedicated hip belt. Even if you’re not carrying much weight, a hip belt is great for keeping the bag secured to your body during high-intensity exercises. The Cloud Walker has a sternum strap that serves the same purpose, albeit not quite as effectively, but a hip belt is something you’d expect from a brand name pack. 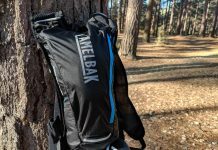 The CamelBak Cloud Walker is a mid-range pack without a lot of storage space, but it has a comfortable design for its size and is good for short outings. You’re paying for the quality that comes with the CamelBak name. External attachment points for trekking poles. Higher price than many of its competitors. If you’re looking for a budget pack, you’d be hard-pressed to find a better one than the Teton Sports Oasis 1100. It’s priced at half or a third of many of the other packs on this list, but it still functions as a pretty great dedicated hydration pack. The 18-liter Oasis has one large main pocket in addition to a smaller organizer pouch located at the front. It’s not really large enough for an overnight trip, but is plenty sufficient for daylong adventures. One of the best features on the Oasis is the inclusion of a loop inside the pack that attaches to the bladder and holds it upright. So few packs have something like this, which prevents the bladder from slumping over and becoming hard to drink from once it’s about halfway empty. The Oasis also includes a built-in rain cover, which is sewn to the bottom of the pack. It’s not as easy to use as a removable cover, but it’s nice that it’s included on such an inexpensive pack. The hip belt, although quite narrow, is another great feature that’s often left off smaller packs like the Oasis. Such an inexpensive pack is bound to have a few downsides, though, and the most prominent one is probably that it’s cheaply constructed. It’s made with inexpensive zippers and thin ripstop nylon, so don’t expect it to last very long if you aren’t treating it with the utmost care. The back panel doesn’t provide much ventilation, either, making it a bad choice if you’re doing vigorous hikes in high temperatures. The Oasis 1100 is a budget-minded pack that doesn’t have the best design, but will keep you hydrated. If you’re unsure about buying a dedicated hydration pack, it’s not a bad one to start with. Bungee cord attachment system for bike helmet or other bulky gear. Internal loop to keep water bladder upright. Narrow hip belt without pockets. While it’s certainly not the cheapest hydration pack, costing as much as many lower end daypacks, it is an Osprey, which means you can count on it lasting. If you need something with more storage space, the Manta is definitely a better option, especially since its padded hip belt will keep the weight off your shoulders. For all but the most strenuous day hikes, though, the Skarab should be sufficient. If you want something even more lightweight, CamelBak’s Cloud Walker is also an excellent choice. In any case, what’s most important is that you stay hydrated. 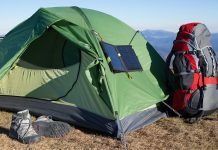 While all of the packs on this list do that to some degree or another, if a pack isn’t doing what you need it to, it’s likely to get left at home. Choose something you’re comfortable with and you’ll find yourself drinking more water, which is always a good thing.